When my wife Daniela asked me if I'd like to move to Ireland, the first thing I thought was: cold, rain and very far away. We were living in Bermuda at the time, so the thoughts of cold and rain had the biggest impact on my psyche. The far away part was the least of my concerns. Though I would no longer be near my family, there were not that many close family ties left for me, and Daniela, who hails from Germany, would be closer to her parents and brother whom she had been apart from for 8 years. So the decision was made, we shall depart for the Emerald Isle and live happily ever after. If only life were so easy, no? Our transition to Ireland has not been smooth by any means, but it has not been so terrible either. There were the usual long winded government red tape issues to deal with when registering as a citizen in a new and foreign country, but with a little grit and determination and the occasional domestic squabble, we have settled into a new life in a land that now affords ample opportunity and of course the charm of its people, beauty and magnificence of its countryside and the richness of its history and ancient folklore. I had to adjust from living life in a small community atmosphere where I knew half the population; Bermuda is only about 20 square miles in total area, to living in a big country with a different culture and not knowing anybody. As it turns out Ireland is a lot like Bermuda. The people are friendly, at least the ones not riding the Celtic Tiger, the term used to describe Ireland's increasing economic wealth, they like to drink and have fun, and they work hard. Okay, the working hard part doesn't compare with Bermuda, but you get the gist! We have settled in a small seaside town in the north of County Dublin called Portmarnock, just around the corner from Malahide, and across the water from Howth. Portmarnock offers us the best of both worlds. We are out in the country living near the seaside, yet only 15 minutes away from Dublin City Center by Dart (Dublin Area Rapid Transport system). It has the best beach in the north of Dublin County, the pace of life is slow and relaxed, there are world class golf courses and. the off license (liquor store) is only a 10 minute walk from my house. What more could a man want! In fact they do have what I could want more, a beer and liquor delivery service called Runner which delivers beer and spirits to your door! If you're thinking about a vacation to the Dublin area of Ireland, I would strongly recommend that you consider staying either here, Malahide or Howth; especially if you like the country, convenience of being near the city and the beach! We hope you enjoy these pages about our area of Ireland, and our other pages about Irish culture, Malahide, Howth, Irish legends and check out our Irish gifts. If you decide to visit us let us be the first to say, Welcome to our Ireland! Portmarnock (Port Mearnóg in Irish) is a village north of the city of Dublin in North County Dublin, Ireland. It lies on the coast and, because of its proximity to Dublin is a popular suburb. We are situated between Malahide, Sutton, Baldoyle and Howth along the Northern commuter railway line out of Dublin. Portmarnock railway station is also on the DART network, The Dublin Area rapid transport system. 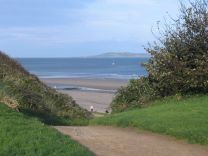 Portmarnock's name derives from the Irish word port – meaning port – and Saint Marnoch or Mernoc. He is said to have arrived in what is now Portmarnock in the 5th century AD. The area had been settled thousands of years before, in Neolithic times. A number of remains of activity in the Portmarnock area from those times is still evident today, with flints and other tools having been excavated at the northern fringe of Portmarnock, while the remains of a ring fort are visible from the air at the south of the town. Portmarnock Beach is a fantastic beach. 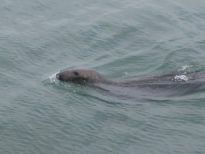 Because of its size it has become very popular with kite and windsurfers. It's great for long walks and shell collecting, and just laying around in the summer sun. As far as swimming goes, I can't help you there, I'm from Bermuda where the water temperature is 80 degrees Fahrenheit in the summer. You get my drift! Like many of Dublin's coastal towns it is home to a Napoleonic Martello tower that's been converted into two beachside apartments for some lucky inhabitants who have a great spot in the summer, though I'm not sure I'd want to spend the winter there. The beach borders the world class golf course of the Portmarnock Hotel and Golf Links which is built around the former home of the Jameson distilling family. The golf course formally opened on December 26th, 1894 and has been home to the irish Open. Another links course, opened in the 1990s, was designed by German golfer Bernhard Langer. Portmarnock actually has two hotels, the other being The White sands Hotel which hosts the nightclub "Tamangos" and has a first class restaurant. There are also lots of Bed and Breakfasts spread around Portmarnock, and if you stay in one, the hospitable and friendly nature of the Irish will make you feel like you've lived your entire life here. If you like walking Portmarnock is a great place to be. It's central to Malahide which is about a 3km walk along the Coast Road. We walk it frequently, and on a beautiful day you don't even notice the time pass by, but in an hour you'll be in Malahide where you can refresh yourself at one of the many pubs or restaurants. 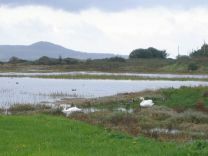 Its also central to Baldoyle and Sutton, where you can continue on a well established trail along the seaside and past beautiful homes to Howth.I wouldn't recommend walking to Baldoyle from Portmarnock however as there is no sidewalk on a good portion of the road and the traffic is frequent. 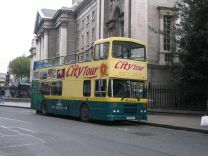 We usually catch the number 102 bus to Sutton Station, the last stop on the 102 route, and walk to Howth from there. So, if you're looking for a unique Ireland experience, come to Portmarnock, we'd love to see you there. You'll recognize me; I'll be the only one on the beach not swimming! Cheers! Malahide (from the Irish Mullach Íde) is our beautiful suburban neighbor to the north. 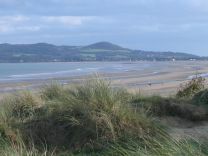 The modern name Malahide (Mullagh h-Ide) derives from around the 12th century, meaning the sand hills of the Hydes, who were a Norman family from the Donabate area. The population today is around 25,000 having grown from 1,500 in 1960 and is still growing. Malahide is also served by the DART line and it’s about a 20 minute ride into Dublin. There is always a hustle and bustle in Malahide, the residents are vibrant and proud of their village's "Tidy Towns" award, bestowed upon only those towns of exemplary cleanliness. 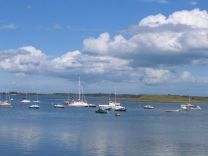 Situated on an estuary that is the only natural inlet along the East Coast, Malahide boasts a beautiful harbor, with a marina capable of berthing around 300 boats and is thus a popular stopping point for visiting yachts that can be seen year round in the bay. 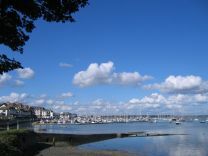 As you stroll through the tiny, tidy town, you'll certainly enjoy the upscale yet quaint demeanor Malahide has to offer. There's a class about Malahide that is easy to enjoy, and it's rich in first class pubs and restaurants. Gibney's is a very popular pub where you can listen too and sing along to traditional Irish songs, but then, every pub in Ireland is good for that! I have a special affinity for Malahide, as it’s where we first stayed when we came to Ireland, and it certainly made it easy to fall in love with Ireland. Learn The Lyrics to Popular Irish Songs So You Can Sing Along At The Pubs! 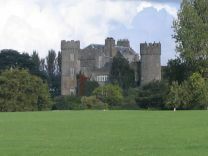 A stones throw from the village center are the grounds of Malahide Castle, former home of the Lord of Malahide, Sir Richard Talbot and his family. The castle grounds are wonderful to walk around and the castle itself makes for an interesting tour. There is also a Railway Museum, Golf Course, Cricket and GAA field in the grounds all nestled snuggly in the beautiful parkland. There are a couple of nice hotels in Malahide as well, The Grand Hotel is situated right on the edge of the town center down near the water, while The Island View Hotel sits a little further up the Coast Road. There are also plenty of Bed and Breakfasts in the area, our favorite is The Malahide Guest House situated adjacent to the Castle grounds and a 20 minute stroll through the grounds to the town center. That's where we stayed upon arriving in Ireland, and the owners Declan and Rosemarie were not just gracious hosts, but were a big help to us, even helping us to move to our apartment when we found one. But that's how the Irish are, everything you've ever heard about their genuineness and good nature is 100% true! Howth (pronounced to rhyme with both; known as Binn Éadair in Irish) is our affluent neighbor across the water. 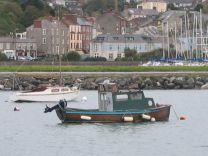 As villages in Ireland go, Howth is one of the quaintest, yet one of the busiest and most popular. Locals flock there on weekends year round, especially on Sundays when they host an open air market full of goodies, and tourists swarm there in the warmer months. Howth was originally a small fishing village and is now one of Dublin's bustling suburbs, also situated on the DART line. The village is situated on Howth Head, a beautiful peninsula, and features a gorgeous little harbor. Beautiful luxury homes span the hillside of Howth Head and overlook the Irish Sea and Ireland's Eye a small island whose most spectacular feature is the huge freestanding rock called the Stack, which plays host to a large variety of seabirds, including thousands of guillemots, razorbills, fulmars, and gulls. Ireland's fifth gannet colony became established on the Stack in the 1980s, and there are now a few hundred pairs breeding there each year. There is a large cormorant colony on the main island, and a few breeding pairs of puffins. You can rent a boat or go on a boat tour that will take you near the island for a closer look at the bird colonies. One of the highlights of Howth is the Grey Seals swimming nonchalantly in the harbor waiting to be fed by generous tourists. This is so possible, as there are several fish shops on the pier where you can buy an assortment of treats to feed them! Howth is also home to some fine restaurants, award winning in fact, and you can be assured that the seafood there is fresh. There are also some less expensive fast food shops, a great fish and chips place and variety shops where you can get a snack. There are also ample Bed and Breakfasts if you choose to stay in Howth, and of course, The Deerpark Hotel, which features one of the nicest golf complexes of all the villages in Ireland. If you like exercise, Howth is the place to be. There is a fantastic cliff walk that takes you completely around Howth Head (about 2 hrs. 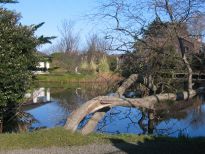 ), and offers majestic sea views and also a great view of Dublin and the Dublin (Wicklow) Mountains. On the top of Howth Head is a museum that features a History of Radio display which is quite interesting and well worth the trip to the top. Needless to say, the views there are also breathtaking, so be sure to bring the camera! The Radio Museum located in the Martello Tower is run by Pat Herbert who owns the collection of antique and classic radios. Pat has collected radios and all the associated paraphenilia that goes with them for over 40 years, and his collection is indeed remarkable. more remarkable is that the majority are in working condition. The museum offers much more than just radios though, and there is also a collection of telephones, phonographs and nostalgia such as posters and cigarettes from the early 20th century. But even more important than the physical content of the museum is the abundance of what Ireland is known for, Irish hospitality and warmth (and of course craic! ), that awaits you there. On the day we attended Pat Herbert was off, but we were more than aptly welcomed by the two gracious hosts of the day Joe Humphries and Joe Dillon. Both were typical irish gentleman and were entertaining, fun and informative. The two Joe's are friends of Pat Herbert and told us that on some days the museum more resembles a social club than a museum, with neighborhood friends assembling for a bit of craic and other social indulgences! Joe Dillon is also an authority on Ham Radio and Martello Towers, and he maintains a website about Martello Towers From Around The World.! Admission is €5 per person and all proceeds go to a children's charity. 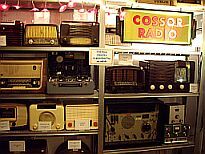 So do a good deed as well as experience a unique and special part of Ireland by visiting the Radio Museum. All in all, Howth is a great destination, and if you're looking for something special to do, especially on a Sunday (market day), visit Howth, one of the most charming villages in Ireland! Here are Some Great Places to Walk in Ireland! If you have a question or comment regarding our part of Ireland please use the form below. We will be happy to help with any query or suggestions you might have. Cheers! Query or Comment About Our Area?